A graduate of Goldsmiths College, London with Postgraduate study at MMU, Jane has been making and exhibiting stitched and printed textiles alongside her lecturing post at Manchester School of Art. 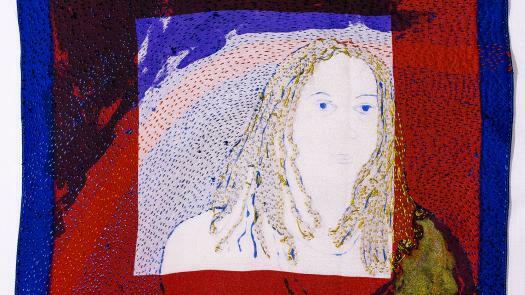 Jane is a member of the 62 group of Textiles artists. Recent publications include jointly authored books with Alice Kettle, 'Machine Stitch Perspectives' (A and C Black) and Hand Stitch Perspectives (Bloomsbury). After 13 years as programme Leader of the BA(Hons) Embroidery programme, Jane moved to the role of Principal lecturer for Widening Participation for the Faculty of Art and Design. 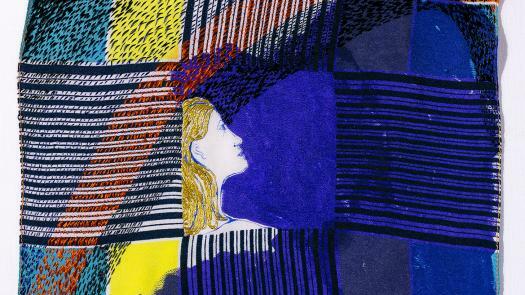 In 2010 Jane became a Director of Studies in the Department of Design with responsibility for the Creative Practice, 3DD, Textiles in Practice, Fashion and Illustration with Animation undergraduate programmes and the MA Design programmes. In 2014 Jane was appointed as Associate head of the Design Department. 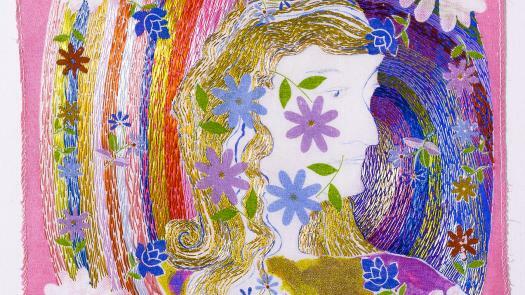 Jane McKeating is a member of the Crafts Research Group. Mitchison, L., 2014. Aiguille en Fete, Paris February 2014, Aiguille en Fete, Paris February 2014, February 2014. McKeating, J., 2014. Scenes of Change, L'Aguille en Fete, Paris, February 2014. McKeating, J., 2013. British Textile Art, Koyo gallery, Showa Womans University, Tokyo, 10th Dec 2013 - 25th jan 2014. McKeating, J., 2013. 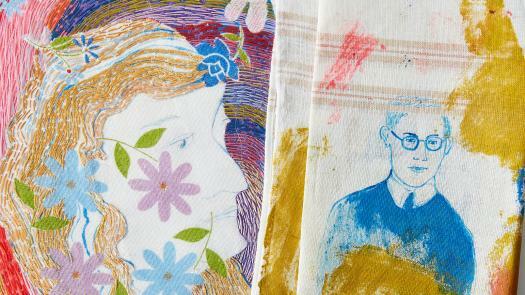 Hand stitch Perspectives, L'Aguille en Fete, Paris, 13/02/13 - 17/02/13. McKeating, J., 2013. Pairings, Conversations and Collaborations, Contemporary Applied Arts, London, 22nd march - 13th April 2013. McKeating, J., 2013. Rendezvous Goldsmiths, Ruthin craft centre, Sept 2013 -Dec 2013. McKeating, J., 2013. SEAMLESS THE DIGITAL IN DESIGN, NATIONAL MUSEUM OF ARCHITECTECTURE & DESIGN, LJUBLJANA, SLOVENIA, 20th Sepember 2013 - 3rd November 2013..
McKeating, J., 2013. Small talk, Constance Howard Centre , Goldsmith College University of London, 4th June - 25th July 2013. McKeating, J., Morris, J, 2013. Surface disturbances, evidence of biological time. Part 1, The searchers Contemporary gallery, Bristol, 8/11/12 - 5/12/12. McKeating, J., 2012. 62@50, holden Gallery Manchester Metropolitan University, july 2012. McKeating, J., 2012. Hand Stich Perspectives, Knitting and stitching show Alexander palace London, Harrogate and Dublin, October -November 2012. McKeating, J., 2012. Interventions, Platt hall, Manchester City Art Gallery, February to May 2012. McKeating, J., 2012. Machine stitch Perspectives 2, L'aguille en Fete, Paris, February 2012. McKeating, J., 2012. Package Tour, Knitting and Stitching show Alexander palace London, Harrogate and Dublin, October -November 2012. McKeating, J., 2012. Pairings II: conversations and collaborations, Stroud International Textiles, Park Gallery, Stroud, April - may 2012. McKeating, J., 2011. Close at Hand, Owens Art Gallery, Mount Allison University, Sackville, Canada, April - June 2011. McKeating, J., 2010. Art School, Holden Gallery MMU, Special Collections, MMU, 2009. McKeating, J., 2010. Machine Stitch Perspectives, Knitting and Stitching show, London, Harrogate and Dublin, Sept 2010 - Nov 2010. McKeating, J., 2010. Textile Narratives, Drumcroon Arts centre, wigan, April - June 2010. McKeating, J., 2010. The 13th International Triennial of Tapestry, Central Museum of Textiles, Lodz, Poland, May - October 2010. McKeating, J., 2010. The China show, Central Academy of Fine arts, Bejing, 2007. McKeating, J., 2010. The Dartboard for witches, Aberystwyth Arts centre, Aberystwyth University, July - october 2010. McKeating, J., 2009. An Embroiderers Eye, Macclesfield Silk Museum, April - July 2009. Kettle, A., 2008. 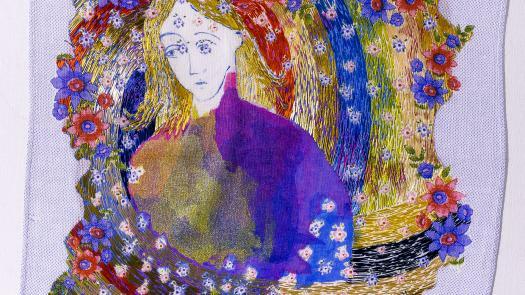 Art of the Stitch, The Waterhall, Birmingham Museum and Art Gallery,, 15 March to 15 June. McKeating, J., 2007. Mechanical Drawing - The Schiffli Project, The Holden Gallery MMU, The Hub Sleaford, Fairfield Mill Arts and heritage Centre, Macclefield Silk Museum, 2007/8. McKeating, J., 2006. Artefact - work in progress, All Saints Foyer, Manchester Metropolitan University, 25th Sept - 6th October 2006. McKeating, J., 2006. 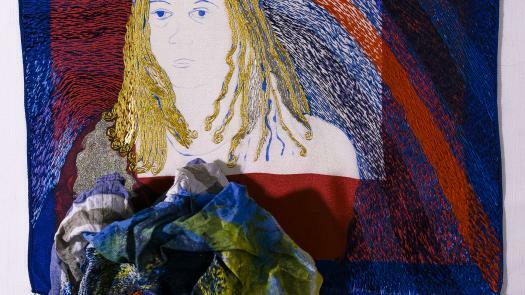 To Boldly Sew: Textiles for the 21st Century, McManus Gallery Dundee, Edinburgh City Art Gallery, 2001. McKeating, J., 2005. 'Jardins Reduits' 8e Triennale Internationale des mini-textiles, Musee de la tapisserie contemporaine, Angers, France. Musee du textile de Saint Gall, Switzerland, Musee Marsil de Saint Lambert au Quebec, Canada, Musee textile de Wesserling en Alsace, Centre d'art contemporain de San Cugat(Catalogne) Spain, 10th dec 2005 to summer 2007 over 5 venues..
McKeating, J., 2003. Art of the Stitch, Williamson Art Gallery, Birkenhead. The Dutch Textile Museum, Tilburg, Netherlands. Hall Place, Bexley, Kent, 30th August 2003- 30th May 2004 over 3 venues. McKeating, J., 2002. Babylove, Bilston Craft Centre, Wolverhampton, 2002. McKeating, J., 2001. 6 Textiles, Kunsthogskolen, Bergan, Norway, 2001. McKeating, J., 2001. A continuing Thread, Leicester City Art gallery, 2001. McKeating, J., 2018. 'Nine Days a Week', MAC Birmingham. McKeating, JE., 2016. 'Shirt from the bottom of the bottom drawer', Knitting and Stitching show, Alexander Palace, London. McKeating, J., 2016. 'Shirt from the Bottom of the Bottom Drawer', Alexander Palace, London. McKeating, J., 2016. 'Waiting for Layla', Upfront gallery, Penrith Cumbria. McKeating, JE., 2015. 'Waiting for Layla', Upfront Gallery, Penrith, Cumbria. Kettle, A., 2012. 'Hand Stitch Perspectives', Bloomsbury, London. McKeating, J., 2010. 'Machine Stitch perspectives', A and C Black, London. Kettle, A., 2010. 'Machine Stitch Perspectives', A&C Black, London. Miller, M., Hemmings, J., Webb, J., Montague, J., McKeating, J., 2008. 'Alchemy: the making of a Magnum Opus'. 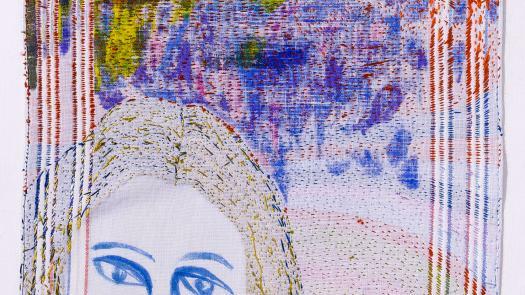 In Alice Kettle at the Winchester Discovery Centre, 18-21, Manchester Metropolitan University. Blakey, S., 2011. 'A Lull in the Conversation', Ceramic Review, Issue 249, Page 50. McKeating, J., 2008. 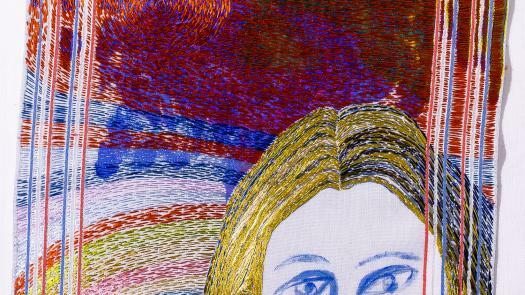 'Manchester, degrees of Change', The World of Embroidery, Sept 2008, 30 - 33. McKeating, J., 2013. 'Radical Thread', Work featured and discussed in printed book, publication to mark 50 years of 62 group. Schoeser, M (Author), 2013. 'Textiles, the Art of Mankind', 3 works illustrated in book.